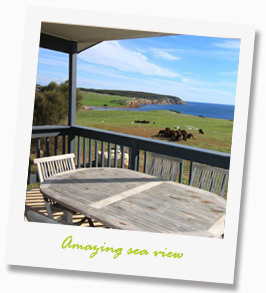 Fully self contained one and three bedroom Seaside Cottages on the north coast of Kangaroo Island. 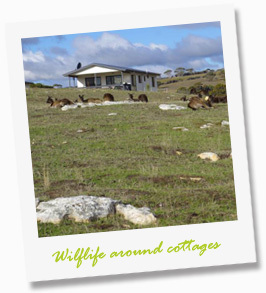 Cottages are set on 80 acres bordering Stokes Bay beach and being revegetated, providing sanctuary to abundant wildlife including kangaroos, wallabies, birds, echidnas, and the occasional koala discovering our newly planted gums. Pods of dolphins and resident pelicans are also sighted often at Stokes Bay. We offer 1 and 3 bedroom cottages. Large cottages have three bedrooms which sleep 6 comfortably (1 Queen, 1 double and 2 x singles). Small cottages have one bedroom (1 x Queen and 1 x fold out single for child is possible). Cottages are approximately 20 meters apart. Kitchen with fridge, oven, toaster, hotplate, microwave, crockery, pots and pans etc. Decorated throughout with new and modern furniture. All linen and towels provided (except beach towels) – Linen fee per person per stay applies. Ceiling fans – due to electricity restrictions there is no air conditioning. Book one of our cottages now or read here what you can do more in the surrounding of Waves & Wildlife Cottages. For any enquires please contact us. 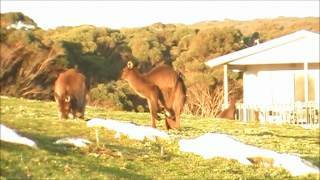 A great video where you will get an impression of Waves & Wildlife accommodation. Big thanks to Kai & Tamara Linke for making the video! Get an impression of the cottages and the surrounds. Instead of driving to see wildlife, stay amongst it. Instead of driving to the beach, stay at it. Instead of driving to go fishing, stay where the fish are. Modern comfortable cottages on a top location. One of the best beaches on KI: Stokes Bay. If you have any suggestions or comments for us, please contact us first. We are happy to improve our business where possible. Thanks! © 2019 Waves & Wildlife Cottages. Affordable seaside accommodation.